3 colored Boogau-bopuragi (북어보푸라기) is an elegant dish that was served to Chosun dynasty kings with juk or rice porridge. Boogau-bopuragi literally means dried pollack lint but it is basically dried pollack finely grated into a powder form. It is seasoned with sugar, sesame seeds and colored with soy sauce and gochugaru (고추가루, red pepper powder). 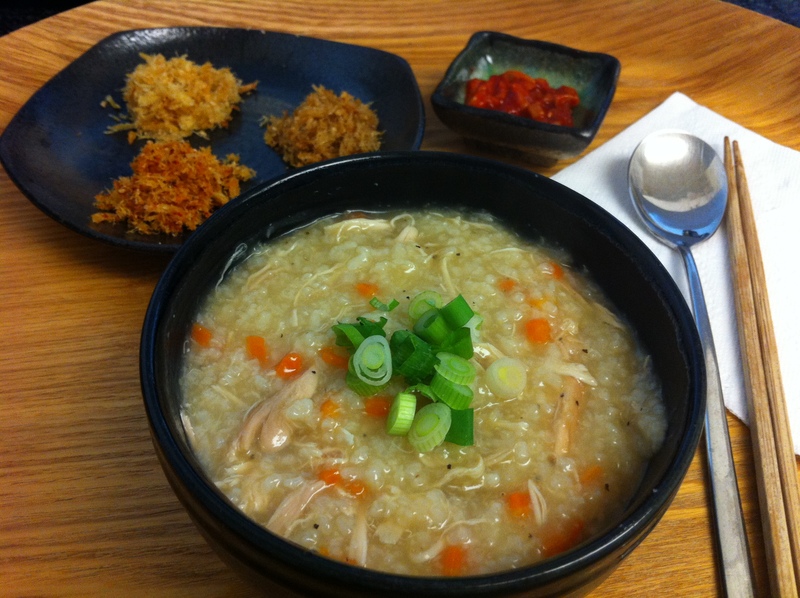 It is great to eat with juk (죽) or rice porridge because juk is often eaten when feeling weak, sick, as baby food or by the elderly. This is because it is nutritious and easy to digest. Boogau-bopuragi not only adds delicious flavor but also adds lean protein and is gentle on the stomach. 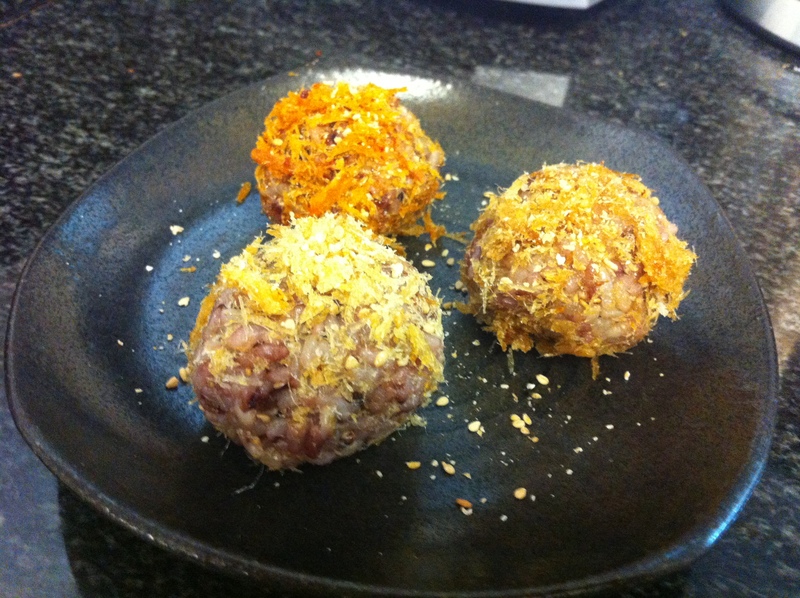 Moreover you can sprinkle it on rice for flavor or roll a rice ball in boogau-bopuragi to make a tasty joomuk-bap (주먹밥, rice ball). 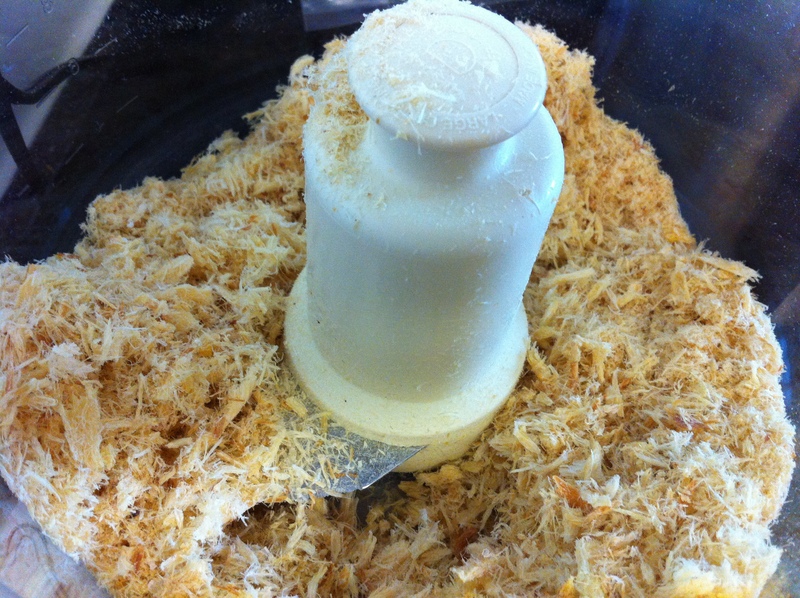 The easiest way to grate the boogau (북어, dried pollack) is to do it in a food processor. 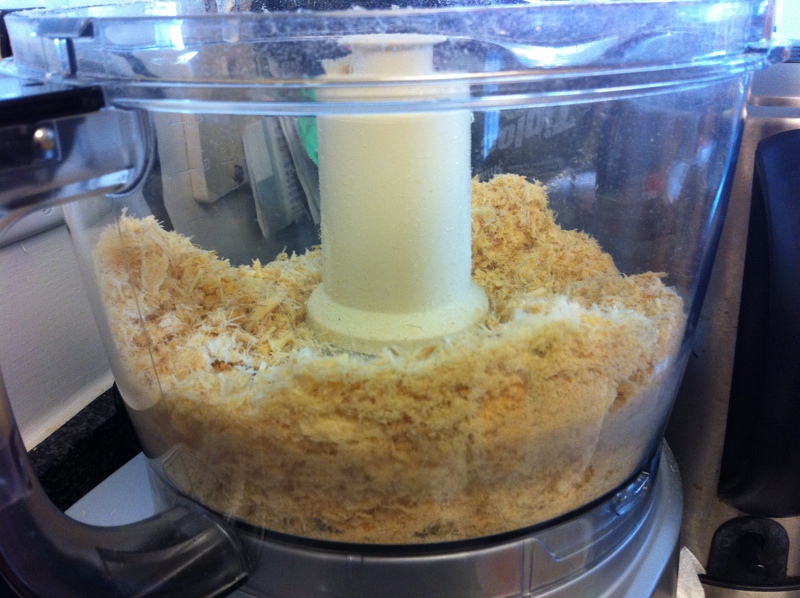 I used boogau that was already cut into strips and used a food processor until the boogau became almost like powder. If you have a whole fish of boogau, cut the head and tail off, and remove any fish bones first. 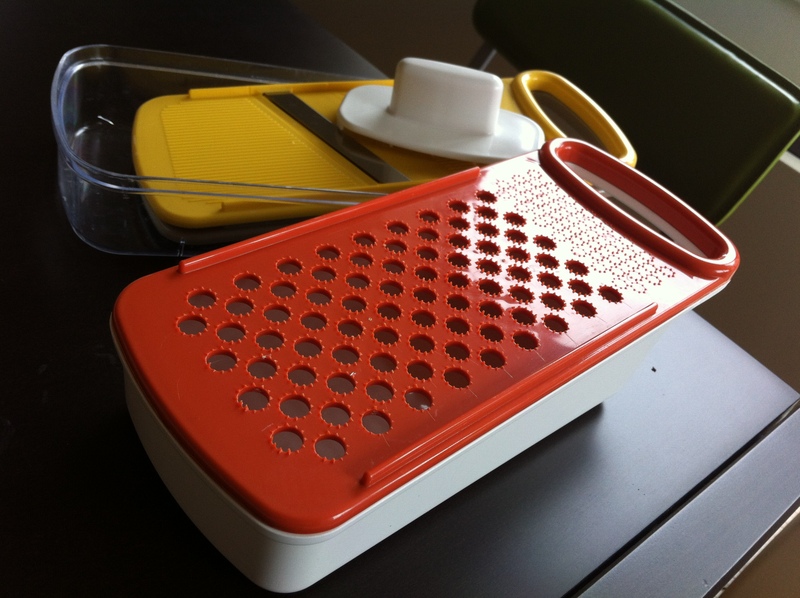 Then, you can use a spoon and grate it by rubbing the edge of the spoon against the grain or use a plastic Asian grater you can find in any Asian market. 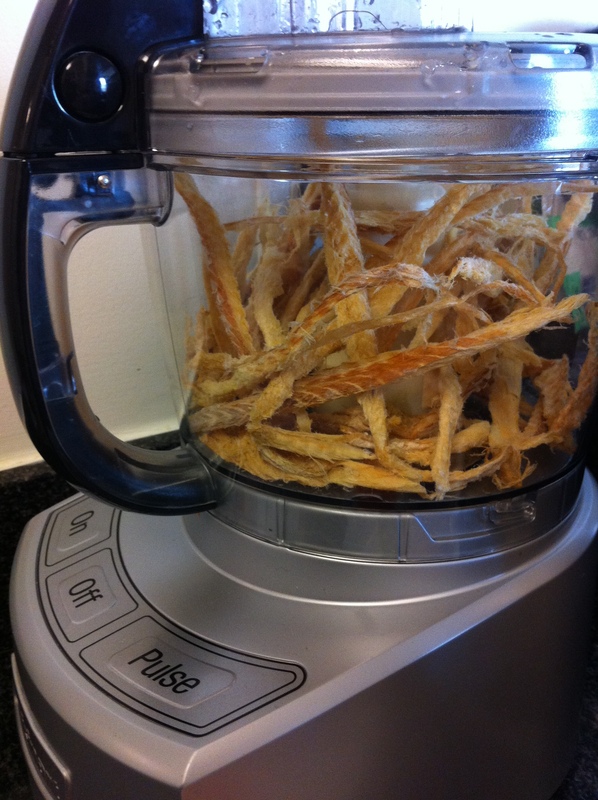 These Asian graters come with two or three mandolin attachments. Grate up to the skin. 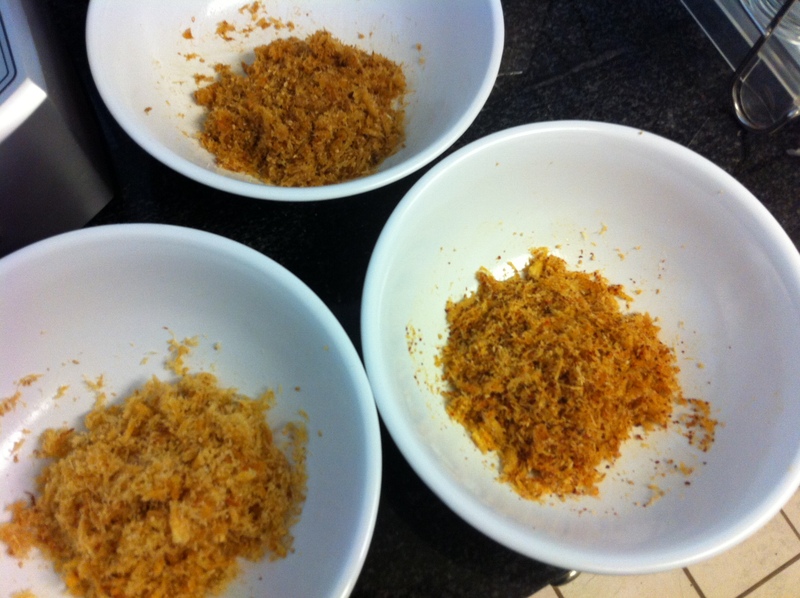 Once the Boogau is finely grated, divide into 3 equal parts in 3 separate bowls. 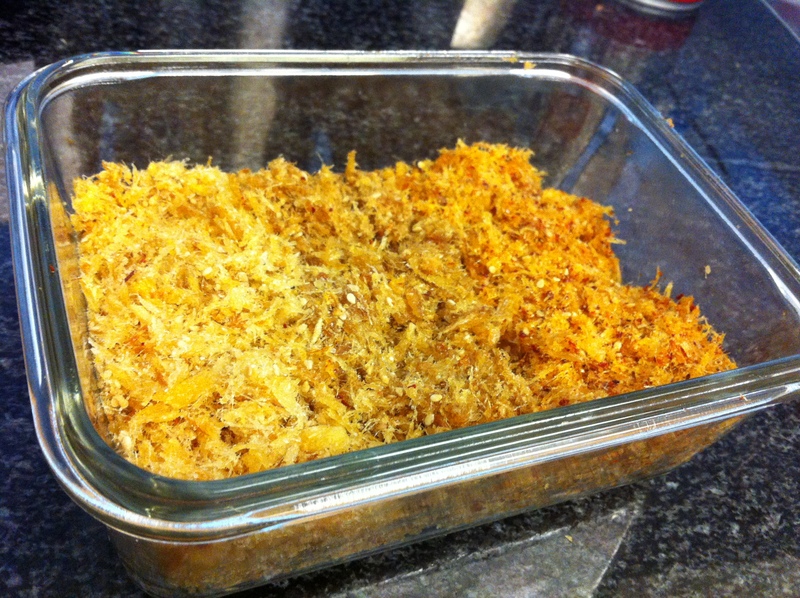 Mix the sugar and salt and divide into 3 equal parts and mix them individually into the 3 separated grated boogau. Add sesame oil into each of the 3 bowls of grated Boogau a little at a time because the grated boogau should remain fluffy but not soaked with sesame oil. Add up to 2 tablespoons of sesame oil into each bowl. In one bowl, mix in 2 teaspoons of soy sauce and add 2 teaspoons of gochugaru into another bowl and mix well. The remaining bowl is left alone to keep its color. Now you have 3 different colors of Boogau-bopuragi. 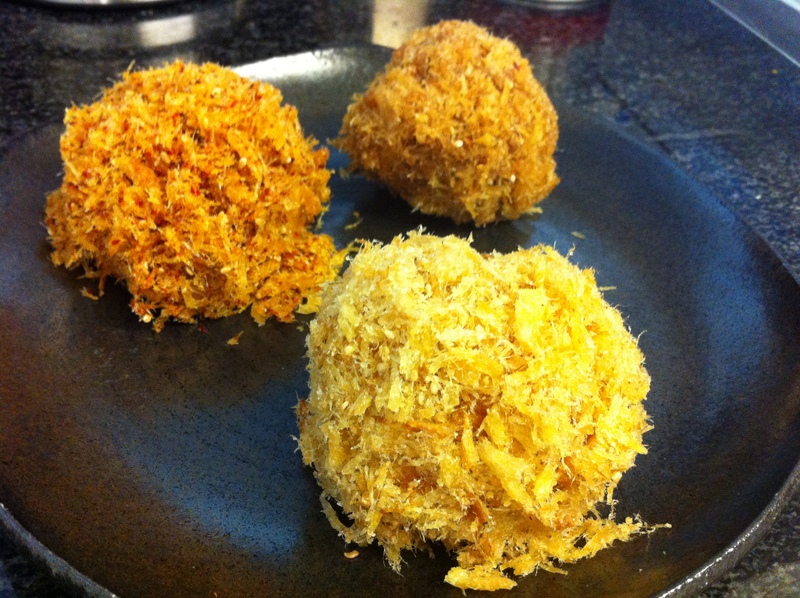 You can serve the Boogau-bopuragi into 3 separate balls on one plate as the photo above. This entry was posted in Banchan (반찬, Side Dish), Seafood and tagged Boogau, Joomuk-bap, Juk by gangnamkitchen. Bookmark the permalink.